Are all surgery staff confident communicating with Deaf patients? “It’s much more common for doctors not to spot and diagnose health conditions in Deaf people. That includes problems which can lead to life-threatening illness.” – Sign Heath, ‘Sick of It’ Report. This is unfair, unjust and has to change. What are the challenges faced by a deaf patient trying to make an appointment, seeing the doctor and accessing test results? What can be done by every team member to make the surgery accessible? 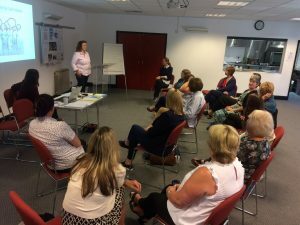 A practical British Sign Language (BSL) session, including greetings, times and dates for booking appointments, directions, and some basic medical signs. Dot Training sessions are also a great way to motivate staff and bond the team. Please contact us to discuss your workplace training needs. In a healthcare setting it is vital to have ‘Go to’ people who hold a Level 1 qualification in BSL. This will enable you to put the certificates in reception so all your patients know who the staff members are. The Level 1 course can be achieved in 60 hours of teaching. Find out more about level 1 training.